The lobby of an office building. 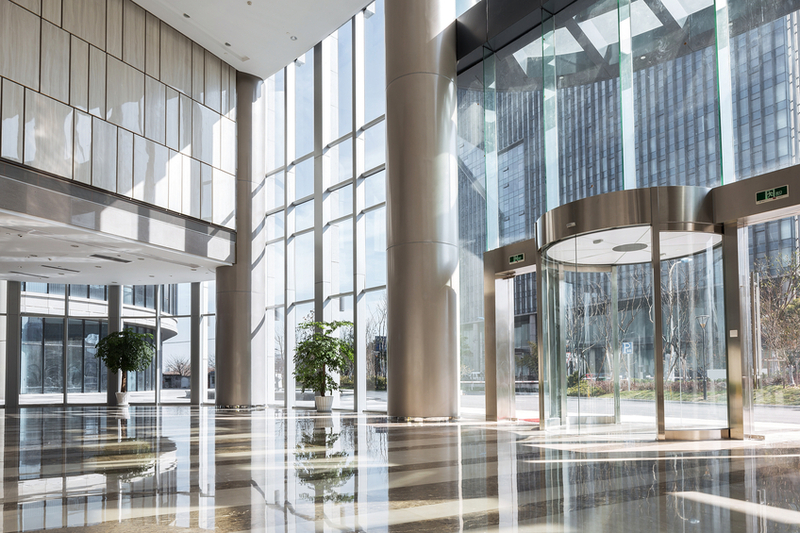 In architecture, a lobby is an entrance hall that works as an anteroom or foyer. In terms of politics, a lobby is ‘a group of people who try to influence government officials to vote in favor of a special interest.’ Related to this, the verb to lobby means ‘to try to influence the actions or votes of someone,’ and also ‘to promote the passing of a bill’ (a bill is a proposal for a law). Helen went through the door into the hotel lobby. The government listens to the arguments of both the pro- and anti-gun lobbies. The environmental group is lobbying for legislation to ensure that more energy comes from renewable sources. The union is lobbying the workers' rights bill. In the 1990s movie The American President, Annette Bening plays an environmental lobbyist who starts dating the president. In this early scene, she attends a meeting with the president (played by Michael Douglas) and voices the views of the environmental organizations that pay her to lobby for them. Thank You for Smoking (2005) is a movie about a lobbyist for the tobacco industry (sometimes called Big Tobacco). Watch the trailer here. In the political sense, lobby is a word that is being adopted in other languages. It is used as a noun to mean a special interest group in both Spanish and French. In French the action of such groups is known as le lobbying; similarly, in Spanish it is known as el lobbying, and to lobby someone would be to hacer lobbying (to do lobbying). Spanish, however, does have a word for lobbying: cabildeo (the verb is cabildear), but more people use the English word in the political sense. In English, the word came to be used for pressure groups, because such groups would wait in the lobbies of political buildings, which were accessible to the public, to accost (ie, aggressively confront) politicians as they came and went from the private chambers, in order to plead their case. Lobby (the part of the building) dates back to the mid-16th century. It comes from the Medieval Latin noun laubia or lobia, which was a ‘covered walkway, usually in a monastery.’ It probably came into English through a Germanic language, though, and is thus related to the Old High German laubia (later lauba), meaning ‘arbor,’ as well as ‘hall or roof.’ In the political sense, meaning ‘a group seeking to influence legislation,’ lobby was first used in the United States near the end of the 18th century, and the related verb appeared in the early 19th century.